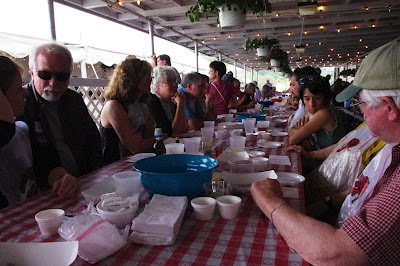 We had a full table of Charlestown Democrats on Sunday, August 19, at Senator Sheldon Whitehouse’s annual family clambake. The event was part food nirvana, part political rally and a large part social, as a record turn-out came to the Senator’s annual feast at the Kempenaar’s Clambake Club in Middletown. Hundreds of state Democrats turned out to support Senator Whitehouse, as well as his two House colleagues, Rep. David Cicilline and Rep. Jim Langevin, all of whom are up for re-election this year. Senator Jack Reed, who is not up for re-election this year, spoke warmly about his colleagues and the importance of sending them back to Washington to serve the people of Rhode Island. Senator Barbara Mikulski (D-MD) came up from Maryland to give the keynote remarks, noting that she considered Sheldon Whitehouse to be a friend and key ally in protecting the rights of women and defending working families from cuts driven by radical Tea Party Republicans who control the House of Representatives. She noted that the Senate has been able to pass bipartisan legislation, only to see it stall and die in the House. She said the solution was to make sure we keep good people in Congress, singling out Senators Whitehouse and Jack Reed for special praise and, of course, supporting Reps. Jim Langevin and David Cicilline for re-election. She praised the Rhode Island Congressional delegation for being perhaps the most collegial and effective team in the country. 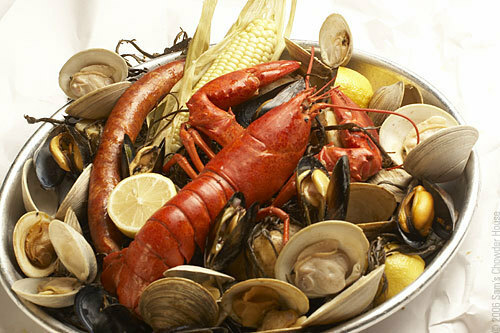 The feast was a traditional New England clambake, featuring steamers, corned on the cob, steamed potatoes, Portuguese sausage, brown bread and lobster.